This fascinating museum was opened in 1973. It is spread on two different sites in the same city. The main building displays the recent nautical history, as well as from the last century and Second World War. It has a collection of models of different ships, nautical instruments and historic photographs. The second site, which is on the opposite side of the port, has a reconstructed Minoan boat and war relics. The museum is well-maintained and has information boards everywhere. It will help you to truly understand the history and importance of this place. Love this? Explore the entire list of places to visit in Chania before you plan your trip. Fancy a good night's sleep after a tiring day? Check out where to stay in Chania and book an accommodation of your choice. How popular is Nautical Museum Of Crete? People normally club together Chania Archaeological Museum and Old Venetian Harbor while planning their visit to Nautical Museum Of Crete. The Maritime Museum charts the naval history of Greece in great detail with some amazing artifacts, models and historical video footage over 2 floors, they also have a shell exhibition containing 100s of beautiful examples. I spent an hr or 2 wandering around and at only €3 entry fee, in my opinion is great value. Definitely worth a visit. Also a great way to escape the heat of the day as it's nice and cool inside. 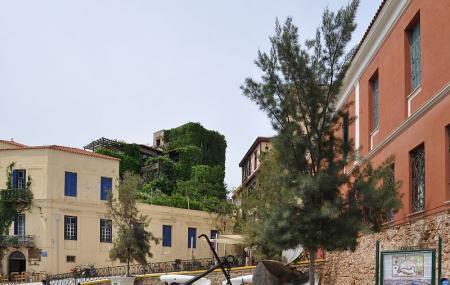 The Maritime Museum of Crete was inaugurated on the 27th of May 1973 by its' founder vice admiral Ar. Giannopoulos, at a time of festivities comemmorating the 32nd anniversary of the Battle of Crete. It is run by a Board of Directors and chairman vice admiral K. Manioudakis. They work hard to preserve maritime history from ancient till modern times and promote scientific projects in the field. They successfully keep the island's maritime history alive through active support of publications, acquisition of items or documents and prize awarding for merit. The museum's collection is housed in a historical building that goes as far back as the 13c. and ranges from miniature reproductions of ancient ships to shell collections and uniforms or weapons of the Second World War. One can easily spend an hour inside. Superb museum chronicling the maritime history of Crete. Well worth a visit. Nice museum, but not a lot of guidance / plaques to understand significance behind exhibits for the average (civilian) visitor. Would be great for navy/military buffs. An amazing museum for any maritime history lover or just a regular visitor like me. For 3 euros you get to see intricately designed exhibits of naval battles, documentaries, incredible ship models from pre- to modern history, actual artifacts from the greek marine. Unforgettable and a must see! Fully wheelchair accessible.